Monday, November 19th, 2018 -- In case you missed this major announcement last week, Phoenix Rising FC removed the intern tag from Tucson native Rick Schantz and has named him head coach. This announcement is coming off the heels of an incredible 2018 season that saw Phoenix Rising FC finish with the most wins in club history and its first playoff victory. The club also advanced to the USL Cup Final where is suffered a 1-0 loss to Louisville City FC. Schantz took over at the helm when former Phoenix Rising FC coach Patrice Carteron left to manage in Egyptian club Al Ahly FC. With 24 matches remaining on the schedule, Schantz guided the club to a 15-7-2 record. This past season was the second time Schantz served as interim head coach. In 2017, he managed the team to three wins in seven matches. In his two stints, Schantz has compiled a 18-11-2, which is a club best 52.9% winning percentage. 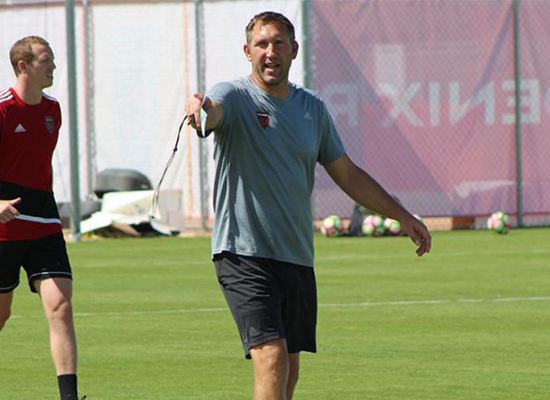 Schantz is the first Arizona native to lead Phoenix Rising FC. He attended Salpointe Catholic High School is Tucson and played college soccer at the University of Portland. On the youth side, he helped start Calcop FC, coached with Fort Lowell Gunners, and was involved with CDO Soccer Club. Additionally, he compiled a 71-22-17 record with PDL's FC Tucson.